There is a great deal of confusion in our profession (as well as many others) about the terms certificate and certification. We have an abundance of marketing and promotional materials in our field which advertise for “certification” in particular modalities or technique methods. 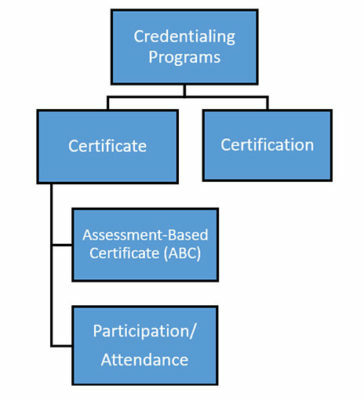 However, this illustrates a common misunderstanding about the distinction between a certificate (which is what these programs are) and a certification. There is currently one major Certification program in our profession and that is the Board Certification offered by the NCBTMB. There is also a certification program offered by the Lymphology Association of North America and one by the Certification Board for Myofascial Trigger Point Therapists. While many other CE programs use the term certification associated with their training, most of them are actually certificate programs. It would clear up a great deal of confusion for professionals in our field and other stakeholders to understand the distinction between certificate and certification programs, so let’s take a look. The flowchart included below shows how these programs relate to each other. There are two main types of credentialing programs: Certificates and Certification Programs. There are also two types of Certificate programs: 1) Certificates of attendance or participation, which in our profession are called Certificates of Completion and 2) Assessment-Based Certificate (ABC) programs, which in our field are called Certificates of Achievement. The major confusion exists between ABC programs (Certificates of Achievement) and Certification programs and that is what this post covers. Yet, we need to clarify the two types of Certificate programs first. In this program an individual gets a certificate simply for attending an educational event. There is no test or assessment method to determine successful achievement of learning outcomes. Attendance or participation is enough to achieve a certificate. An assessment-based certificate (ABC) program requires a specific learning course or program. There is an end-of-program assessment which determines that an individual has successfully achieved the designated learning outcomes associated with the course. The participant can’t receive the certificate from simply attending the course, but must complete the final assessment process. The primary focus is the completion of a specific educational program that has clearly intended learning objectives. The purpose of the program is to provide a particular track of training and the certificate awarded designates the participants have successfully completed that specific training. The primary purpose of a certification program is to provide an assessment of knowledge, skills, or abilities (KSAs) required for competent performance of a specific professional role. The professional role is usually defined by a comprehensive job analysis study. The KSAs may be acquired in a wide variety of methods or training programs. The certification is also designed to measure continued competence through the requirement of recertification or renewal requirements such as regular continuing education. A governing body or credentialing organization is NOT required to oversee the program. However, the program should function with input from subject matter experts and qualified individuals. A governing body or credentialing organization with representation from relevant stakeholders should oversee the certification program. This body maintains control over all essential decisions related to the certification program. In our profession the credentialing organization for overseeing our one primary certification program is the NCBTMB. The program provider conducts, sponsors, and/or develops the educational training program required for the certificate. The assessment for awarding of the certificate is based on the content of that specific training program. The primary focus of the assessment is to measure designated learning outcomes from that individual training program. The certification program provider conducts the program independent of any specific education or training program. Therefore, the certification is NOT linked to a specific class, course or other educational program and the certification assessment is NOT designed to measure specific learning outcomes of any specific class or course. The certification program provider is not the sole provider of any educational programs that may be used to prepare for the certification examination. The ABC is generally NOT time-limited and does not expire at the end of any time period. There is usually no additional requirement for subsequent activities or other continuing education course work. The certification is time limited (it will lapse at the end of a predetermined period.) To maintain the current credential, the certified individual is required to pursue additional activities such as continued professional development in order to ensure continued competence. Certificate holders are NOT awarded a specific acronym or designation to put after their name. They may state having completed a “certificate in XYZ”, but do not use the term or phrase “certified” in any particular discipline. Individuals who completed the certification program may often designate themselves as certified in “XYZ” or with other types of credentialing designations such as specific letters that appear after their name (such as BCTMB, CPA, or ATC). Credentialing is an important part of helping stakeholders and other professionals recognize education or training benchmarks that have been achieved. It would be helpful if we can develop a greater degree of consistency within the profession around the naming of our credentialing programs so they follow these defined standards. That would greatly help reduce confusion among professionals and the public as well.